your looks so nice!! we used plastic leaves off a small flower bunch. 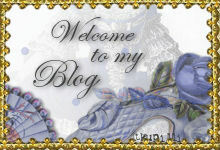 I love post your link to my blog too for the tut. Thank you so much for the tut. I am trying to learn how to make different flowers and I appreciate it. Im Minifreunde-Forum sah ich erstmals solche winzigen Hortensien. Auch durch dieses Forum habe ich diese Seite mit der wundervollen Anleitung entdeckt. Ich bin erstaunt, was für tolle Ideen und Talente hier zu entdecken sind. Herzlichen Dank für diese Super-Anleitung! May I ask is this from American Miniaturist magazine tut? Hi sorry I had the wrong magazine is the tut from DOLLHOUSE MINIATURES MAGAZINE?? Thank you for the tutorial. Is very helpful! 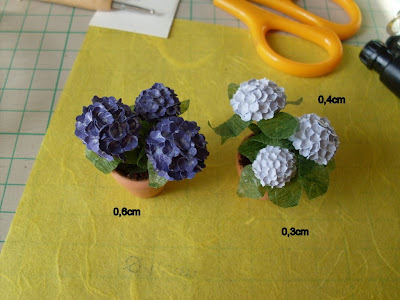 These are great looking hydrangeas and I am happy to now learn how to make them for the miniature garden that I hope to someday and one day, get to. I like the way that you have yours potted up. That may be the best way to start, for me. Thanks again.